Saudi Crown Prince Mohammad bin Salman recently concluded his three-week tour across the United States. He courted America’s tech giants, in hopes they will bring their booming business to Saudi Arabia. The Crown Prince met with Apple, Google, and Amazon, with the desire to convince the latter into building a tech hub in their kingdom through generous subsidies. Mohammad bin Salman—MBS for short—is reinventing the oil-rich desert kingdom. The Crown Prince’s trip is a part of a broader plan to restructure Saudi Arabia’s economy in the coming years. The Saudi Arabian government published a proposal to change the Kingdom’s economy and strategic situation in the coming decades called “Vision 2030.” It has three primary goals. First, it plans to make Saudi Arabia to the center of Middle Eastern tourism. Next, MBS wants to attract massive foreign investment. Lastly, it wants to take advantage of its strategic location between Asia, Europe, and Africa. All of these programs will work to divert Saudi Arabia’s economy away from their dependence on oil revenues. Historically, Saudi Arabia focused solely on drilling its oil-rich land for its economy. As a leading member of OPEC, the Organization of the Petroleum Exporting Countries, it manipulated the global oil market in its favor. OPEC is a cartel of oil giants that agree to change their output of oil to maximize their profits. Saudi Arabia’s shift away from an oil-based economy underscores the growing weakness of the organization. Saudi Arabia and OPEC’s diminished dominance of the global energy market comes during America’s shale revolution. In the past decade, American natural gas exports have exploded because of the discovery of shale across the nation and new technology to make “fracking” cheap. This surfeit of natural gas has driven down oil prices and the market’s sensitivity to changes in output from OPEC. Without its control over the global oil market, Saudi Arabia is forced to diversify its economy. Mohammad bin Salman’s ambitious plans do not stop with Saudi Arabia’s economy. His foreign policy strategy has been bolder than his predecessors. Primarily, he has taken an aggressive stance against Iran in their regional conflict. Across the Middle East, Saudi Arabia and Iran struggle for dominance. One prominent example of Saudi Arabia’s confrontational approach to Iranian ascendancy is the proxy war in Yemen’s civil war. In the civil war, Saudi Arabia supports the pro-government faction and Iran funds the Houthi rebel group. To the chagrin of the United States and other countries, Saudi Arabian support has been part of a humanitarian disaster in the war; its blockade of the nation has starved the populace of relief. Saudi Arabia has said it will take measures to allow aid and resources into devastated areas. More recently, Iran and Saudi Arabia’s rivalry may soon extend into Saudi Arabia. On April 16, the Wall Street Journal reported that the United States asked Saudi Arabia and other Arab countries friendly to the US to replace American troops in Syria. America’s force in Syria was used to eliminate the Islamic State; now that IS has been effectively defeated, the Trump administration wants to cease direct American involvement in the civil war. If Saudi Arabia were to agree to replace American presence in the region, it could accelerate Saudi-Iranian tensions. Israel highlighted Iran’s support to Bashar al-Assad’s regime in Syria on April 17, when it released locations and images of Iran’s air bases that dot the Syrian landscape. Saudi Arabian troops would work near the Iranian military. Although America’s support in Syria was to destroy IS, Saudi Arabia may be tempted to undermine Iranian operations. If they were to do so, the states would risk direct conflict. MBS’ adventurous policies also extend into the social and cultural customs of Saudi Arabia. Last year, the Kingdom lifted its ban on driving for women. This change will take effect in June of this year. Saudi Arabia hopes that this will brighten their international image. On April 18, Saudi Arabia ended its ban on movie theaters by screening “Black Panther.” The viewing allowed men and women to sit together, a landmark change. Mohammad bin Salman’s shifts on women’s rights may be instrumental in bringing success to the Vision 2030 plan. Critical to the strategy is to attract the world into Saudi Arabia, which may be impossible while the Kingdom continues its ultra conservative policies. American tech giants may be hesitant to build in Saudi Arabia without significant gains on women’s issues. The Crown Prince’s immense power within Saudi Arabia stems from a dedicated effort to consolidate power within the ruling class to MBS. Most notably, MBS imprisoned many of Saudi Arabia’s wealthiest business owners until they paid hefty fines in an anti-corruption campaign. To do it, Mohammad bin Salman established a new graft-fighting council with himself at the helm. 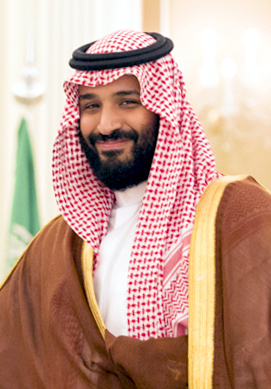 Similar to Chinese President Xi Jinping’s crusade against corruption, this move allows MBS to target individuals suspected of disloyalty to the Crown Prince. With potential opponents to MBS subdued, he now has full reign to reform Saudi Arabia in his image. Mohammad bin Salman has worked to restructure the governing system of the Saudi Kingdom. Before MBS’ purges against his rivals, policymaking was a slow process. All members of the royal family—which was a large family—had to come to a consensus before any significant decisions could be made about the Kingdom. The Crown Prince removed those barriers in order to centralize all power into his hands. As a result, any resistance to MBS or his policies will be directed toward him. The Crown Prince is taking considerable risks by centralizing power in a historically consensus-driven state. His rivals within the government and business owners may work to regain their influence, preceding internal turbulence. While many powerful individuals may be against MBS’ work, the anti-corruption campaign is popular among the young population. As the young of Saudi Arabia grow along Mohammad bin Salman’s popular economic and social policies, they will push to keep him in power. Mohammad bin Salman is taking Saudi Arabia on a radical path toward modernization which could spell disaster or success for his tenure. A favorable outcome for the Crown Prince will depend on many factors inside Saudi Arabia and other international actors’ reactions to MBS’ policies. I want to obtain more followers by submitting my images to blog sites. Like when people click through, they will link to my blog. I simply want to say I am just all new to weblog and honestly loved you’re web-site. More than likely I’m going to bookmark your site . You actually come with tremendous articles and reviews. Thanks a bunch for sharing with us your web-site. I truly wanted to send a quick remark to thank you for some of the superb facts you are showing on this website. My rather long internet lookup has at the end of the day been recognized with really good concept to go over with my co-workers. I would point out that most of us visitors are rather endowed to exist in a wonderful network with many outstanding individuals with very beneficial ideas. I feel extremely happy to have come across the website page and look forward to some more fabulous times reading here. Thanks once more for all the details. I wish to express my admiration for your generosity supporting men and women who actually need guidance on your area of interest. Your real commitment to passing the message around became exceedingly powerful and have always enabled professionals just like me to get to their aims. Your own informative key points can mean a great deal a person like me and substantially more to my colleagues. With thanks; from each one of us. I am just commenting to let you know of the awesome experience my wife’s princess enjoyed viewing your site. She realized numerous details, with the inclusion of what it is like to have an ideal giving mindset to let many people without hassle understand a number of advanced matters. You undoubtedly exceeded our own expectations. Many thanks for showing those precious, safe, informative and even fun thoughts on your topic to Jane. I wish to express some appreciation to you for rescuing me from this particular predicament. Right after checking through the the net and getting suggestions that were not productive, I was thinking my life was over. Being alive without the presence of approaches to the difficulties you’ve solved as a result of your good guide is a serious case, and those that would have badly affected my career if I had not encountered your blog. Your capability and kindness in taking care of all things was helpful. I don’t know what I would have done if I had not encountered such a stuff like this. I can at this time look ahead to my future. Thanks a lot so much for the high quality and result oriented guide. I won’t be reluctant to suggest the website to anyone who desires assistance on this area. I must express some appreciation to this writer for bailing me out of this type of condition. After browsing through the world-wide-web and getting solutions which were not powerful, I figured my entire life was done. Living minus the strategies to the problems you have resolved as a result of the short post is a crucial case, and the kind that might have negatively damaged my career if I had not encountered the website. Your actual understanding and kindness in handling almost everything was tremendous. I don’t know what I would’ve done if I hadn’t discovered such a thing like this. It’s possible to at this time look ahead to my future. Thanks for your time very much for your high quality and effective help. I won’t think twice to recommend your blog to any individual who needs guidance about this problem. I wanted to compose you a very little remark to give many thanks once again for your personal breathtaking ideas you’ve discussed on this page. It’s so surprisingly generous with people like you to provide openly just what many people could possibly have made available as an electronic book in making some dough for their own end, even more so since you could have done it in case you wanted. The tactics as well worked like a good way to know that other people have a similar passion just as mine to know the truth a whole lot more regarding this matter. I am sure there are thousands of more enjoyable opportunities in the future for individuals that scan through your blog. I wanted to compose a note to be able to say thanks to you for all the great techniques you are sharing at this site. My considerable internet lookup has now been honored with pleasant suggestions to share with my contacts. I would believe that we site visitors actually are unequivocally endowed to live in a fantastic site with many special professionals with valuable solutions. I feel very much lucky to have come across the website and look forward to some more amazing minutes reading here. Thank you once more for a lot of things. I’m also commenting to let you be aware of what a brilliant encounter my cousin’s girl encountered reading through your blog. She noticed numerous things, with the inclusion of what it is like to have a very effective helping nature to get men and women without problems have an understanding of a number of impossible subject areas. You actually surpassed people’s expectations. Thank you for supplying the precious, safe, educational and even unique thoughts on this topic to Tanya. I intended to draft you a tiny note just to say thanks as before for all the striking thoughts you’ve provided on this site. It was quite surprisingly generous of people like you to allow unhampered what most people would have sold as an e book in order to make some cash on their own, even more so considering that you could have done it in the event you wanted. Those strategies additionally served to become great way to realize that some people have the same zeal just as mine to learn a little more around this issue. I think there are lots of more pleasurable situations up front for those who scan through your website. I would like to show appreciation to you just for rescuing me from this particular issue. After surfing around throughout the search engines and getting ways which were not powerful, I believed my entire life was over. Being alive without the approaches to the difficulties you’ve solved by way of your blog post is a serious case, and the kind which may have in a negative way damaged my career if I had not encountered your web blog. Your own personal understanding and kindness in controlling everything was valuable. I am not sure what I would have done if I hadn’t discovered such a stuff like this. I can at this moment look forward to my future. Thanks a lot so much for the reliable and results-oriented guide. I won’t hesitate to endorse your blog post to any individual who should have guide about this problem. I want to express some appreciation to you for bailing me out of this particular predicament. Just after scouting throughout the the web and finding thoughts that were not beneficial, I was thinking my life was gone. Existing without the approaches to the difficulties you have sorted out all through your main report is a serious case, as well as ones which could have in a wrong way affected my career if I had not encountered your site. Your training and kindness in playing with the whole lot was valuable. I’m not sure what I would’ve done if I had not discovered such a solution like this. I’m able to at this time look ahead to my future. Thanks for your time very much for this expert and amazing guide. I won’t think twice to suggest your site to anybody who should have guidelines about this situation. Needed to put you the bit of word to finally say thanks again considering the lovely ideas you’ve discussed on this website. This has been simply surprisingly generous with people like you to convey unhampered all that numerous people would’ve sold as an electronic book to get some cash for themselves, even more so since you might have tried it in the event you wanted. These pointers likewise acted as the fantastic way to recognize that other people have the same desire the same as my very own to find out a lot more with respect to this problem. Certainly there are millions of more pleasant situations in the future for those who go through your site. I enjoy you because of all of your effort on this web page. Kim take interest in working on internet research and it’s really easy to see why. My spouse and i notice all regarding the lively mode you convey vital tips by means of the website and as well cause participation from other individuals on that point plus my daughter is actually being taught a whole lot. Take pleasure in the rest of the year. You are always carrying out a glorious job. I together with my buddies ended up reviewing the good procedures found on your site while instantly I had an awful suspicion I had not thanked you for them. The boys were so happy to see them and have undoubtedly been loving these things. Thanks for indeed being well kind and also for pick out this form of high-quality information most people are really wanting to be aware of. My personal honest regret for not expressing gratitude to earlier. I would like to express my thanks to you just for rescuing me from such a circumstance. After surfing around throughout the world-wide-web and obtaining solutions which are not powerful, I assumed my entire life was gone. Living without the answers to the problems you have fixed through your main guideline is a serious case, as well as those which might have badly damaged my career if I hadn’t discovered your web blog. Your own personal capability and kindness in taking care of all the pieces was vital. I don’t know what I would’ve done if I had not come across such a step like this. I can at this time look ahead to my future. Thanks so much for this reliable and results-oriented guide. I won’t be reluctant to endorse your web page to any individual who needs and wants assistance on this area.